The latest Osprey Elite book is on the gear worn by the USMC during WWII. Like the equipment of most warring nations, this changed as the conflict progressed and it was discovered what worked and what did not. This includes the variety of uniforms and patterns as well as their personal firearms and any additional munitions they may have normally carried with them. I have found it amazing while looking through the books in this series that there was such a variety. One normally thinks of US uniforms as being pretty static. Same with the equipment, but that is not the case at all, and while the Marine of 1945 in many ways looked like the Marine of 1941, there were considerable differences. 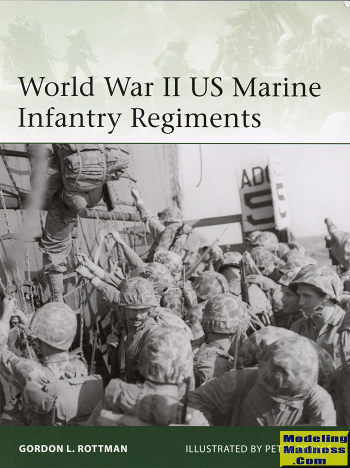 The author has decided to provide us more with the history of USMC infantry divisions than on the actual uniforms and equipment they wore, treating the latter as more of a sideline than anything else. It opens with a general description of what made up an infantry division. Then it proceeds with how the make-up of these units changed over time. The USMC was woefully unprepared for the Pacific war and it took time to solidify what worked and what did not. There is then a brief section on regimental tactics before we get into short histories of each of the regiments that fought in WWII. This includes their battles as well as awards earned and those troops that won the Medal of Honor. All of this is superbly illustrated with some great period photos. Further enhancement is provided by quite nicely done color illustrations. In all, it helps those who don't live and breathe the subject make sense of what can be a complex topic. Highly recommended. For more on the complete line of Osprey books, visit www.ospreypublishing.com.